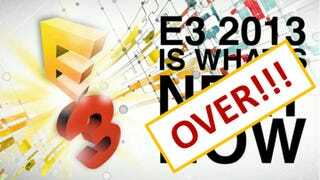 E3 2013 marked the birth of a new generation, a grand stage fight amongst two industry giants, tons of new games for old systems and companion apps… oh the companion apps! In retrospect, I’m left with a strange feeling about this year’s E3 which I can’t quite put my finger on. Perhaps I went into the show with too high of hopes and was disappointed by my own expectations. The fact remains that I left the show with a feeling of mediocrity. That is not to say there aren’t things to be excited about and I was impressed by many things that I saw, hell I pre-order a PS4! I think if I can put it plainly, many of the new games announced or revealed at E3 had that overwhelming feeling of staleness. Take Ryse: Son of Rome for instance, I got a chance to play it on the show floor and aside from its semi impressive graphics, it was a disappointing generic button masher with in-combat quick time events a la God of War. This was the first new game (aside from MSV) that Microsoft showed off; its opening statement for the Xbox One. This was the game that is supposed to get me excited for this new generation? I just felt so sadly derivative. I supposed these are launch games and in time we will see the new and exciting IP’s that will go on to be the leaders of this new generation. Like I said, there were still plenty of things to see and be excited about, so let’s get to it. The last three years I have been to the Sony press conference, it has also been a good show but never a great show. This year was a great show. You might have heard of legendary haymaker that Sony threw and it was not downplayed at all. I have never seen a minute long applause break in any of the gaming press conferences where people were losing their minds, it was truly amazing. Sony also featured great support for indie developers as well as admitting that the PS Vita has gone underused but would be coming back with full support. I walked out of Sony’s press conference knowing I would own a PlayStation 4, if there intent was to sell system, well mission accomplished. Also, I am not sure if I have seen it discussed, but basically PS4 is the new Wii U. With the cross functionality that the Vita has with PS4, you will be able to snap any game you have running on PS4 onto your Vita and go anywhere, which is an amazing function. With the touch screen of the Vita, who is to say that Wii U games can’t be ported or simultaneously developed for both systems? At Sony’s booth I got a chance to touch the controller and got to feel the new Dual Shock 4 (You had to play Drive Club, as it was the only playable PS4 game at the Show). It was pretty surprising how thick the controller was. It felt a lot closer to the 360 controller then the Dual Shock 3. The design of the console itself was pretty slick and the rhombus shape of the console was much easier on the eyes then the Xbox One. Also, the last of us looks almost graphically as good as all currently announced PS4 titles. Microsoft promised games and we did get games, just not enough to overcome the PS4 shot to the bow. A friend said to me later in the week that the Microsoft press conference felt like a 7 out of 10, but after the Sony press conference it was more like a 4 out of 10. This is mostly because at the end of the day, as Jason Schreier pointed out the DRM and price point detracted from their E3 full of games. The new Kinect is actually, pretty cool. Its ability to read facial expressions, heart rate and sense up to three people in a room with way better fidelity were all impressive. This new Kinect has a better understanding of the human body, if you turn your hand it recognizes that the back of your hand is now facing towards the screen with red and green sensors. At the end of the day however, I am just not sure what this means for gaming. While some really cool uses of the Kinect could result from this, I think it may have the same problems that the Wii U has now, where no third parties are utilizing the technology in a meaningful way. Project Spark looked great and on the show floor, it showcased more of what that game can do than the press conference. That game is basically Little Big Planet 2 on steroids. You can create your own musical instrument that actually plays music; make a 2D dual stick fighter like Geometry Wars and all other kinds of crazy stuff. Also, Dead Rising looked great as well but it’s taking a rather odd direction. Rather than going further into silliness with its 3rd installment ala Saint’s Row the Third, they are going with a very serious story line, which doesn’t fit right. Sure all the wacky stuff is in that game still, but it’s trying to have its cake and eat it too, and you never eat cake in front of Zombies, you just become tastier. Stephen Totilo just posted about this earlier today, but I did come away with the impression that Nintendo was playing it safe and so missed a really good opportunity to make a strong argument for the Wii U. Every game Nintendo announced was something I have seen before on a different platform. Nothing felt new or existing, and whether or not Miyamoto wants us to consider what a sequel means on paper these games are less than exciting or buzz worthy. Super Luigi, Super Smash Bros, Super Mario 3D World and Mario Kart are all just updates with very little changing. Games so closely aligned with their origins cannot really be seen as new, things have to change. Remember Pokemon snap? That crazy game had completely different gameplay and a unique premise as did the original Luigi’s Mansion, Metroid Prime and the original Wind Waker. These games all took existing franchise and gameplay and evolved them into something new and unique. Those innovations are all missing from the games that were announced. The Wii U has no draw for me at all, and I love Nintendo. If they want me to get one, then I need a new IP or a new approach to an old IP that offers and experience I cannot get anywhere else. Because of their inability to announce that, I am not sure I will be getting a Wii U anytime soon and I don’t think that is a sentiment that is unique to just myself. At the end of the show, people asked me what they thought the games of the show were and to me that list is: Destiny, Titan Fall and Watch Dogs. All three of these titles had impressive appearances (albeit Watch Dogs was a little stale) and for whatever reason these were the games that most of the crowd talked about. However, I should note that The Division got a lot of people talking too, and its E3 demo was really something spectacular. Personally for myself, I really liked Dead Rising 3, Plantz vs Zombies: Garden Warfare, Duck Tails and Infamous: Second Son. I was admittedly really excited for the Kingdom Hearts III announcement but it’s so far off, who knows when that will be coming our way. Dying Light and The Evil Within had an interesting trailers but I wasn’t able to see too much from either of those games. Final Fantasy XV looks just horrible, I was almost broken from the serious after XIII and this game looks to be doing everything that I have come to dislike about Final Fantasy. Also, one thing is for sure though I continue to be horrible at driving games, between Gran Turismo 6, Drive Club and Fortza 5 I put more cars into ditches than a Midwestern snow storm. What’s with your companion: It seemed like this year way too many games featured either smart glass functionality, companion apps or some other out of game integration to manipulate the in game content. Like in Dead Rising 3 where a companion app lets you nuke your way out of zombie hordes. I don't play games with companion apps and I don't want to, which makes the integrations seem annoying to me. Drop the swag bag: I whole heartily subscribe to the Giant Bomb E3 rule that states "If someone is carrying a swag bag around E3, security should immediately take the bag from them, destroy their badge and ask them to leave the premises". The Capcom Zombies were a little much: While I totally understand Guerrilla marketing and Capcom wanting something unique on the show floor, paying actors to stumble around like zombies for 7 hours, groan like idiots and grab show goers all kind of felt a little dumb. I am a grown adult, I know these aren’t zombies, I know these are just underpaid actors looking for work and this was the best they could do, and it was kind of depressing. Mascots and Cosplay: As with any E3, there were people dressed up as all of your favorite characters from Sack Boy to Cooking Mama. One thing I was always curious about but never found out is who gets paid for what? I assume someone dawning a hot Sack Boy outfit would net you some form of compensation, but are there just Cosplayers that got to the show in their favorite characters dubs for free? It’s an interesting thought that some companies are willing to pay for representation, while others get it for free.